You will find plenty of space in this Cougar fifth wheel thanks to triple slides throughout. 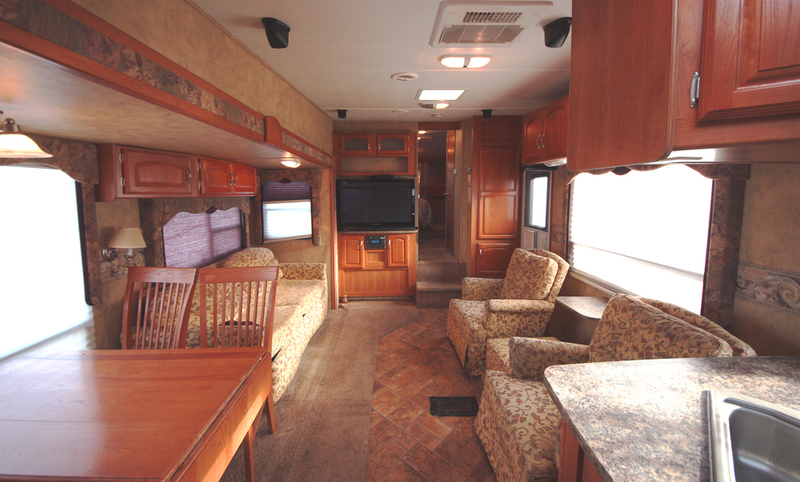 This American 5th wheel features a rear living layout, a spacious master suite, plus a fully equipped kitchen. As you enter notice the two recliners along the rear wall with overhead storage and an end table between the two. Straight ahead through the door find a hide-a-bed sofa with storage above, and a booth dinette for mealtime, games, and more. An entertainment center nearby features a 40" LCD TV and can easily be viewed from most of the seating in the room. The kitchen area features a slide out pantry, counter area with overhead storage space, a three burner range, and a refrigerator too. Head up the steps to a bedroom. The on-suite bathroom features a neo-angle shower, toilet, and sink. The second sliding door offers convenient access from within the bedroom where you will find a queen slide out bed, window storage along the opposite wall, and a full height front wardrobe with nightstand, and wardrobe with washer dryer, plus so much more!